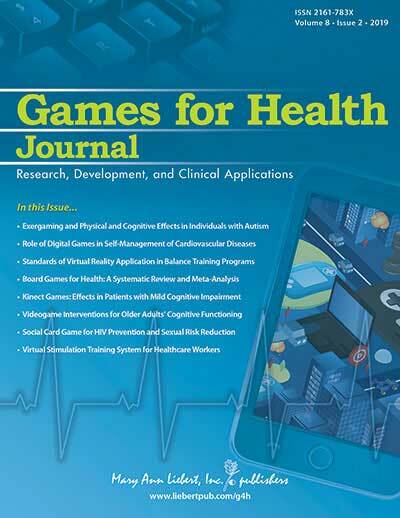 It is with great sadness that we have to tell you that Fabien Vais, one of the founders of the AccessAbility SIG, passed away September 17, 2014. Fabien Vais with the AccessAbility SIG 2005 Pacesetter Award certificate at the Honors Banquet. Fabien and the rest of the founding team of what was originally the Special Needs Committee worked hard to make known the concept of “accessibility” to the world of technical communicators. Fabien was a stubborn, tireless, and passionate advocate for accessibility. 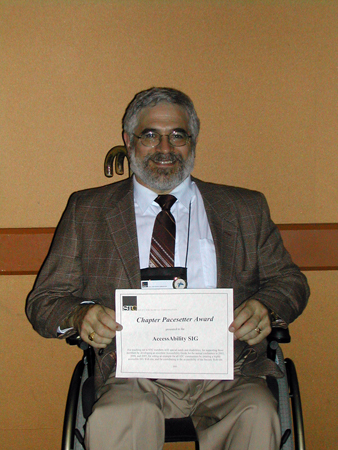 He initiated the conference accessibility guide to the annual STC conferences. In the very first issue of our now defunct Achieve! newsletter, Fabien explains how he and Dan Voss toured the site of an upcoming conference and discovered "that never-ending corridor leading to a dead-end with seven steps! We had passed an elevator that would have avoided the cul-de-sac 150 feet earlier, but there was no sign directing individuals in wheelchairs to take that route. That was a perfect example of the importance of proper signage." Fabien touched the lives of many members of the SIG and the STC. Here are some photos that are bound to bring back some memories. 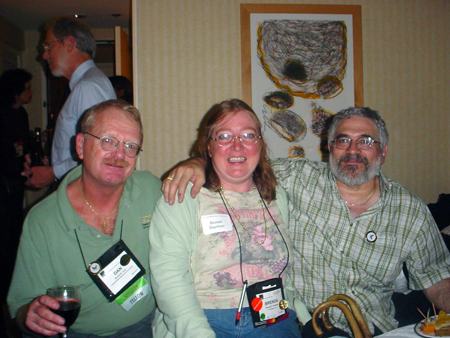 At the 2005 STC Annual Conference in Seattle, Washington, Cynthia Lockley took the following photo at the AccessAbility SIG mixer. On the left is Dan Voss with a glass of wine, Brenda Huettner in the middle with a big smile, and Fabien Vais on the right. Fabien is not wearing his conference badge around his neck like the other two, but he is wearing the enamel AccessAbility SIG pins we made as conference giveaways that year. There are quite a few photos of Fabien from the 2003 STC Annual Conference in Dallas, Texas. Gail Lippincott took a photo of Jodi, Gail, Melissa, and Fabien in front of a statue of a black-colored elephant with large white tusks. 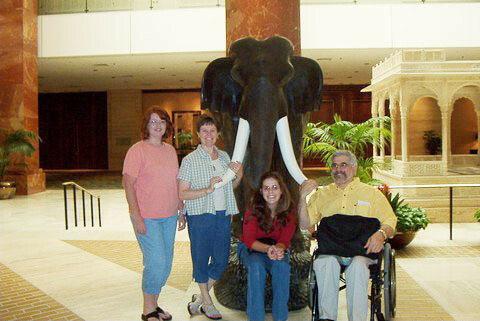 Jodi and Gail are standing on the left, Melissa is seated in front of the elephant, and Fabien is in the wheelchair he used for traveling. When Dan Voss and Fabien got together, things always got silly. In this photo, Dan is passing on the SIG Manager position to Fabien. 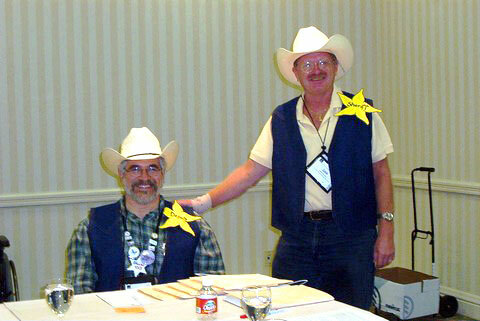 The photo is called "Deputy Fabien and Sheriff Dan" because both are wearing 10-gallon white cowboy hats (they are in Texas!) and blue vests each with a giant sheriff star made out of yellow construction paper! 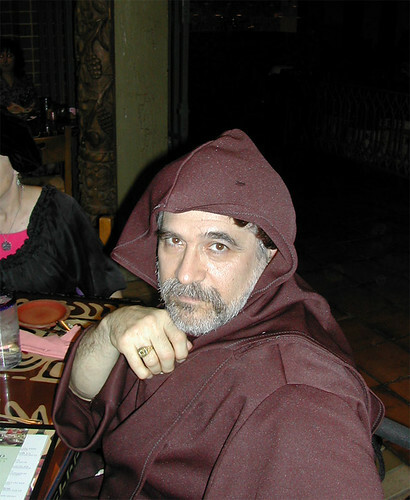 Later, still in Texas, Fabien Vais donned a monk’s cloak! In this photo by Cynthia Lockley, he is seated at the dining table looking very much like the photo’s title: His Reverence. Three other members are seated at his table. 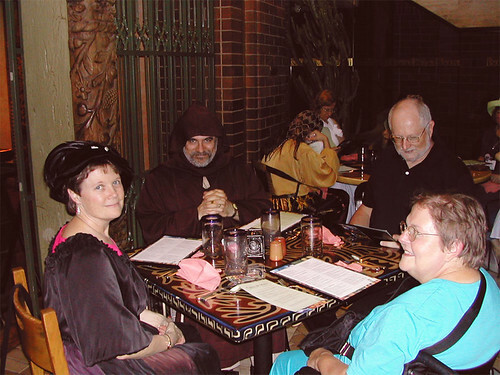 Two seem very respectful of His Reverence – Gail Lippincott on his right in medieval dress, and Judy Skinner seated across from him in a bright turquoise shirt. The man on Fabien's left seems more interested in studying the menu! Cynthia Lockley took another close-up of Fabien as a monk. He looks seriously into the camera with the brown hood over his head, but the dark locks of the monk’s wig peeks out from under the hood in contrast to the elegant silver of Fabien’s hair and beard. Cynthia also snapped a photo of Fabien at the SIG luncheon. 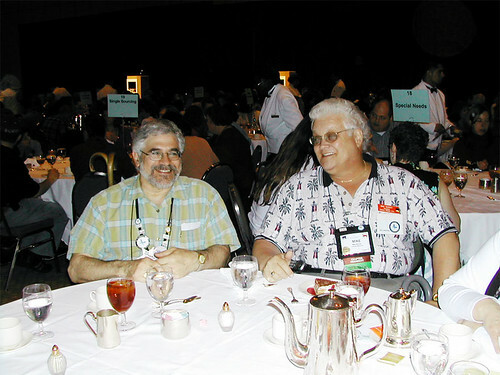 In this photo, Fabien is seated with Mike Murray at the typical big round luncheon tables they have at conferences. With only glasses of ice water and ice tea and a spoon in front of them, it looks like this was taken right before dessert or coffee time. 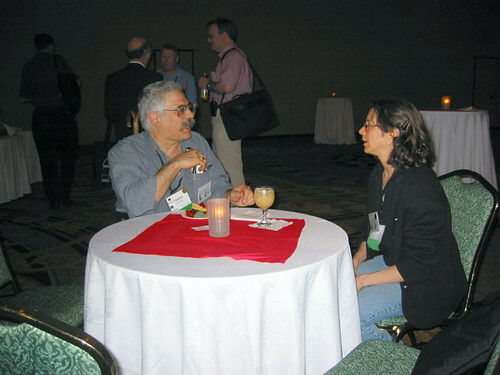 At the 2002 STC Conference in Nashville, Cynthia snapped a photo of Fabien discussing plans for the progressions with Lori Gillen at a small round tables with white cloth covering. 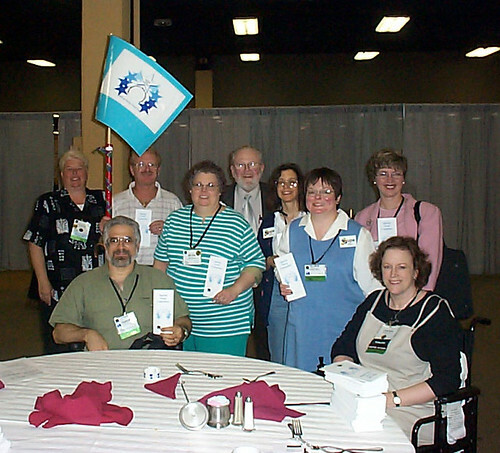 In Chicago for the 2001 STC Annual Conference, nine people got together for this photo of the Special Needs Committee business meeting. Fabien is seated in the front on the left and Cynthia Lockley is seated on the right. The other seven people are standing in the background. Dan Voss is holding a light blue paper flag with the logo of the Special Needs Committee. On the table in front of Cynthia are a stack of brochures about the committee. 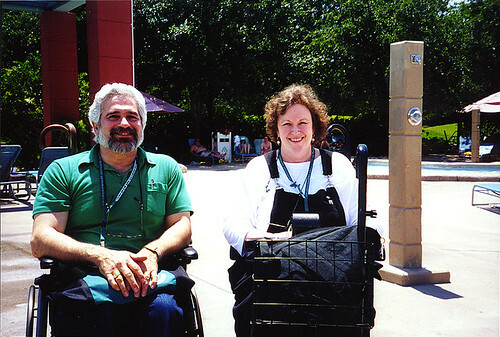 At the 2000 STC Conference in Orlando, Carolyn Kelley Klinger snapped a photo of Fabien Vais in his wheelchair and Cynthia Lockley in her scooter smiling in the sun by the Dolphin Hotel pool. Travel down memory lane and see more photos of Fabien in our photo albums on Flickr. Please do share your memories of Fabien in the comments. We extend our condolences to Fabien's family.